Last month, a “king tide” brought Boston Harbor up to the sidewalk of Long Wharf, seawater flowing through cutouts in the concrete barriers. For those few hours, the border between the built and the natural shifted, creating a sense of dislocation and, for some, wonder. 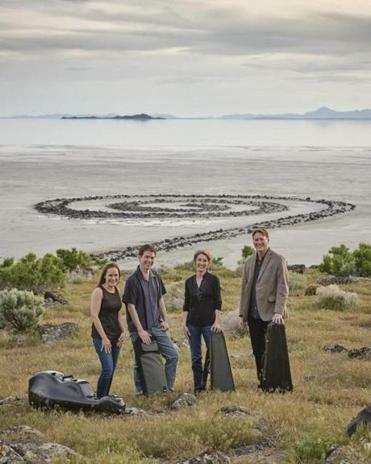 This liminal zone is the territory of the Fry Street Quartet’s recent release on Navona, “The Crossroads Project.” The Utah-based group performs commissions by American composers Laura Kaminsky and Libby Larsen. Both pieces center on themes of nature and sustainability, and are accompanied by topical narration and visuals when performed live; at this point, environmentally oriented performances are nothing new, but this music is deep enough to engage on its own. Kaminsky’s “Rising Tide” moves from organic, eddying lines to more rigid structures. In “H20 (The Source of Life),” a lonely solo voice meanders through layers of shifting strings, amassing momentum and might until all four lines are crashing forward in rapids that diminish to the solo again. “Bios” and “Forage” evoke the pulsing lives of plants and animals, and “Societas” deconstructs into haunting, harried almost-chaos among innumerable towers of chords. Larsen’s “Emergence” is a newer addition to the group’s repertoire, and its modes hop from inviting post-minimalism to electrifying dissonance to twisted nostalgia, ending with a pensive ascent. The Fry Street Quartet plays fluently and fluidly, with remarkable unity in unintuitive passages.